SPIN is a standards-based way to define rules and constraints for Semantic Web data. Using SPIN one can express business rules in SPARQL and execute them directly on any RDF data and models. SPIN is an open specification that has been submitted to the World Wide Web Consortium (W3C) and can be viewed on the W3C site. For more informating on SPIN support in TopBraid Composer, see here. TopBraid Composer™ from TopQuadrant is an enterprise-class platform for developing Semantic Web ontologies and building semantic applications. TopBraid Composer has been integrated with AllegroGraph to provide a scalable triple-store backend. Franz is a partner of TopQuadrant to distribute TopBraid Composer as part of its semantic applications solution. Fully compliant with W3C standards, Composer offers comprehensive support for developing, managing and testing configurations of knowledge models and their instance knowledge bases. Composer provides a flexible and extensible framework with a published API for developing semantic client/server or browser-based solutions, that can integrate disparate applications and data sources. TopBraid Composer is a professional development environment for W3C’s Semantic Web standards RDF Schema, the OWL Web Ontology Language, the SPARQL Query Language and the Semantic Web Rule Language (SWRL). Composer can be used to editRDFS/OWL files in various formats, and also provides scalable database backends (AllegroGraph, Jena, and RDF4J) as well as multi-user support. 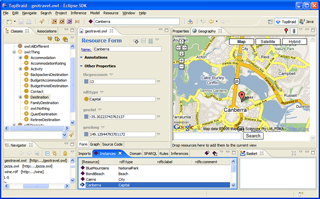 Composer provides a comprehensive set of features to cover the whole life cycle of semantic application development. In addition to being a complete ontology editor with refactoring support, Composer also can be used as a run-time environment to execute rules, queries, reasoners and mash-ups. 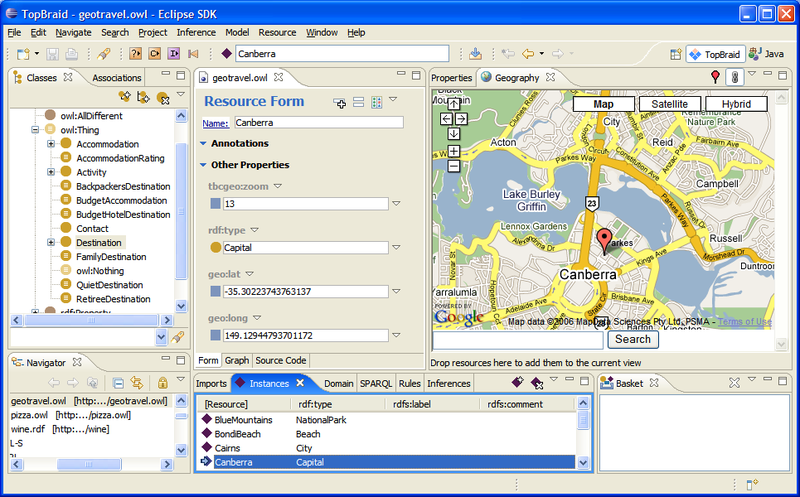 Based on Eclipse, Composer can also be extended with custom Java plug-ins. This supports the rapid development of semantic applications in a single platform. TopBraid Composer is a trademark of TopQuadrant Inc.